One of the biggest tourist draws in Victoria is the glorious 243km-long Great Ocean Road, built in the 1920s as a works project to employ ex-First World War diggers and to connect the small settlements and farms along the western coast of Victoria. It was seen as a boon to rural industry and logging, as well as tourism. Little did the 3000 workers who laboured with pick and shovels and other hand tools to forge the road through rugged virgin bush, nor Howard Hitchcock, whose company built the road, ever dream that they were opening up one of Australia’s greatest tourist attractions, at what is now known as the Twelve Apostles. Located in Port Campbell National Park, the Twelve Apostles were once known as the Sow and Pigs, with Muttonbird Island to the west near Loch Ard Gorge regarded as the “sow” and the smaller stacks as the “piglets”, the Pinnacles or (after the 1930s) the Twelve Apostles, despite there never being more than nine. In July 2005 the tallest (50 metres high) of the stacks collapsed, leaving the current seven stacks. The individual stacks are not named after the biblical characters, but the two large stacks on the eastern side of the viewing platform are kYenown as “Gog” and “Magog”. The stretch of Victoria’s coast west of Cape Otway to at least Portland is built on soft yellow limestone sediments which were deposited during the Miocene Epoch between 15 and 20 million years ago. The rock strata are poorly consolidated, with low levels of calcium carbonate, so the rock is soft and crumbly in most cases. The coast along here is exposed, even on calm days, to a high energy environment. The long gentle roll of swells coming in from the Southern Ocean as a result of prevailing south-westerly winds constantly slap at the base of the cliffs, which can be up to 70m high. On truly stormy days wave surges up to 30m high crash against the soft rock, and erosion is relatively rapid the year round. It is estimated that on the Port Campbell Coast a headland can reach a point of collapse in just 600 years, first forming an arch as undercut caves join up, then isolated as a small island and then worn down into a stack (such as seen at the Twelve Apostles). Recently discovered stacks, located in deep water off the coast in this region, are believed to have been inundated by rising sea levels about 6000 years ago, marking the advance of the coastline by over a kilometre in that time. Yearly erosion is generally thought to be in the order of 2cm per year, so in places where the road skirts along the top of the cliffs a new road route will not be far away. The limestone rock strata, known as the Port Campbell Limestone, contains a rich fauna of fossils, including many seashells, sea urchins, bryozoans and the remains of whales and giant sharks which once grew up to 15m in length and left their teeth, up to 15cm in length, on the ocean floor after feeding frenzies. The Twelve Apostles is the best known tourist locality along this visually rich section of coastline, and from early morning until late afternoon a regular stream of tourists make use of the car park and visitor centre across the road. 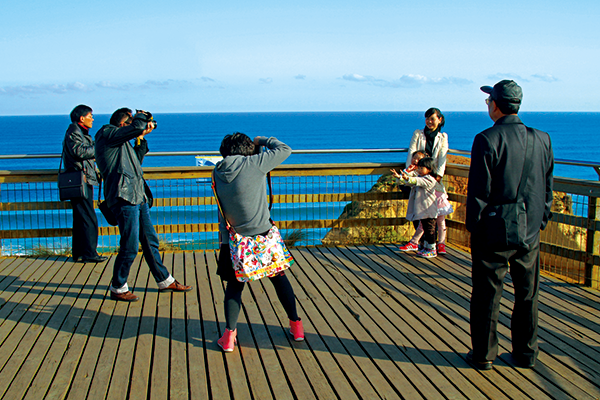 Chinese tourists especially favour the one-day bus trip from Melbourne, with a non-stop coastal drive from the capital to take in the scene and then return via the shorter inland route later that day. 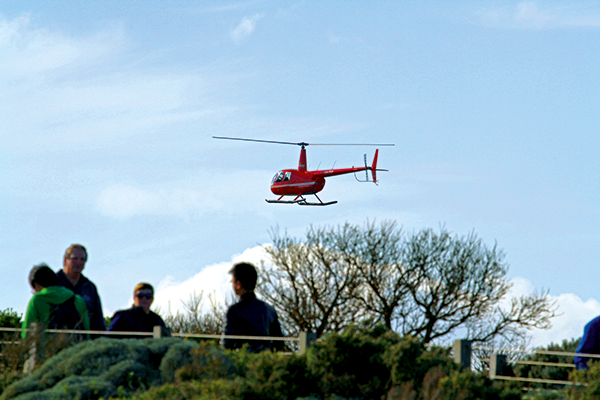 Helicopter flights from the nearby land site are a great and popular way to see this spectacular coast from a unique perspective. There is an excellent series of viewing platforms at the Twelve Apostles, with access to the beach level from a small car park at Gibson Steps, 1.1km east of the main viewing area. This car park fills rapidly and should it be full you can park at the main Twelve Apostles visitor facility and use the Great Ocean Walk path leaving from the south side of the centre. The return trip is 2.2km, plus the walk down to the beach. 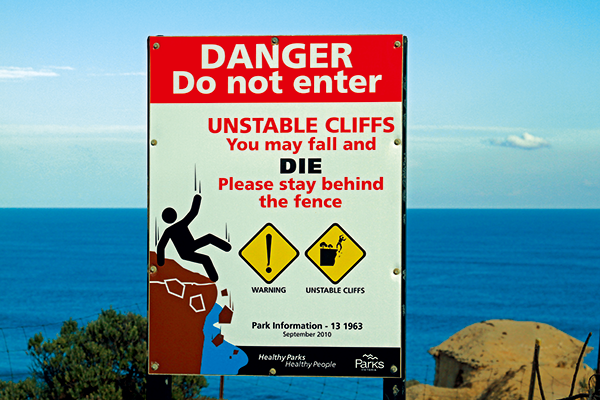 The steps are reasonably steep and can be wet at times, and care should be taken in the event of high seas and tides which can leave the beach dangerously exposed. Camping facilities are limited along the coast but nearby Port Campbell is a favoured spot, with an excellent campground fronting onto the small beach and offering easy walking access to the restaurants and shops of the village. There are several proposals for major tourist facilities at the Twelve Apostles to try to capture more of the tourist interest in the local area. There are an estimated two million visitors to the Road each year, and the RACV rates it as Victoria’s single largest tourist attraction. The area is rich in wildlife, with migrating whales, fur seals and penguins to be seen seaward, and kangaroos, wallabies, koalas, echidnas, bandicoots and reptiles visible on land. 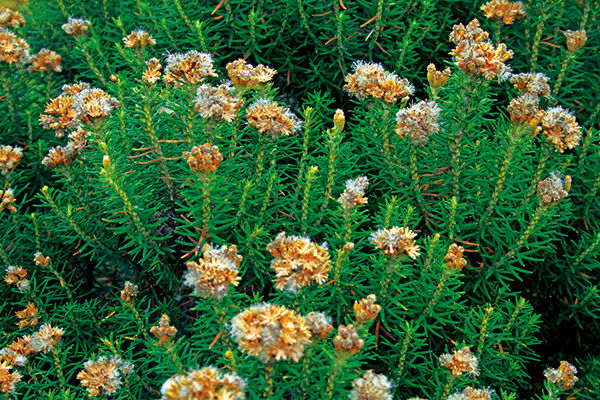 The clifftops are clothed in a dense heath that survives in the poor soils in the tough wind-blown environment. Contrast this with the tall and lush temperate rainforest of the nearby Great Otway National Park. 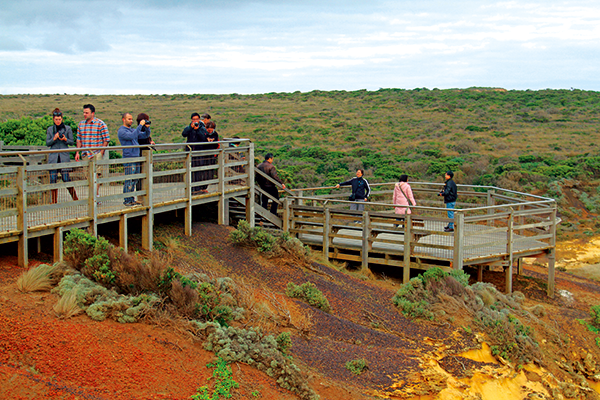 Guides to the fauna and flora of the region can be obtained at the Port Campbell Visitor Information Centre. 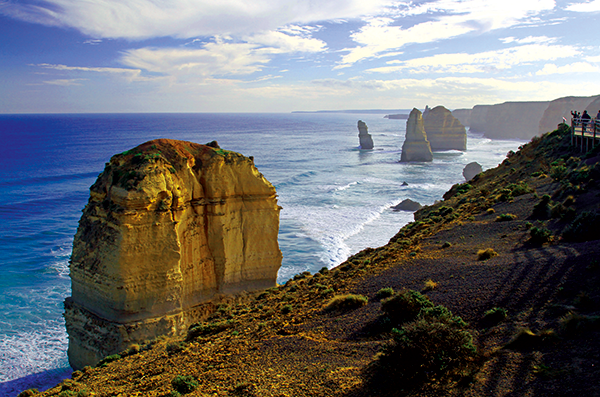 The Great Ocean Road, from Cape Otway westward, skirts a stretch known as the Shipwreck Coast. Most especially in the 19th Century, immigrant ships heading to Melbourne and goldfields areas inland of there, would head up the west coast of Tasmania after a rapid trip in the wild latitudes of the “Roaring Forties” and then turn eastward along the coast. Onshore winds, errors in navigation and wild seas often drove ships onto this then desolate stretch of coast. It is unknown how many shipwrecks litter the coast along here, as many suspected, as well as known wrecks have never been found, but it believed that as many as 700 ships many have come to grief here over a century of sea travel. Among the best known was the Loch Ard, which ran aground off the embayment that now carries its name in 1878. From this wreck there were just two survivors. There are reminders of these incidents at the many wayside car parks along here, and any descent to the water level should be accompanied by a couple of minutes pondering the experiences of the many thousands of people who lost their lives here in wild seas.